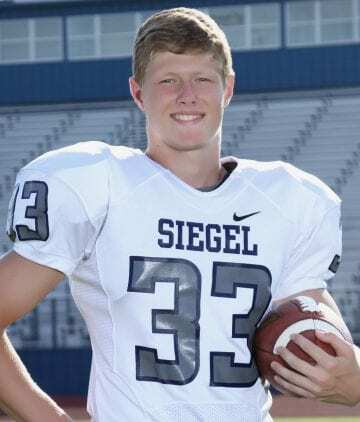 Baylor Bramble, the 17 year old son of SeniorPastor David Bramble and his wife Christy, suffered a severe brain injury during a football game on Friday night, October 23rd, 2015. 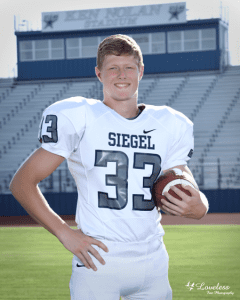 His family requests prayer for God’s miraculous healing for Baylor. It has been a crazy few weeks, full of ups and downs. When Baylor is healthy, he has amazing moments of therapy. However, he has also had several days of illness, which makes therapy difficult and sometimes even impossible. We were scheduled to come on Thursday of this week; however, yesterday his oxygen dropped significantly and he was transferred back to Northwestern Hospital. We are not yet certain when he will be transferred back to SRAL, nor are we certain of when he will be able to come home. One thing we are certain of – God is in control! Pray for Baylor’s lungs to continue clear up & his oxygen levels to remain high. Pray for continued progress in his therapy. Pray for strength for Christy as she continues to exemplify God’s calling as a mother. “Do not fear, for I am with you; do not be afraid, for I am your God. As stated in my previous update, Baylor was transferred to Northwestern Hospital on June 10th. After a couple weeks of incredible care from their amazing staff, he was transferred back to Shirley Ryan Ability Lab (acute care floor) on June 22nd. I am pleased to share that he had his best night yet – last night! We have been told that his new discharge date is July 6th, which unfortunately means that he will not be able to complete a couple of the therapies that he was originally scheduled to receive. Pray for an extension at SRAL so that he can finish all his previously scheduled therapies. Pray for his best week of therapy yet at SRAL. Cannot thank you enough for your continued support! Thank you again for all your prayer support. On 6/5/18 Baylor received an extension to stay at SRAL until June 28th! We were so thankful for this extension; however, early Sunday morning (6/10/18) he was discharged and transported to a local hospital (Northwestern) in Chicago. Baylor is still fighting pneumonia as well as a bacterial infection, which are causing his oxygen levels to drop considerably. Pray for Baylor’s lungs to clear & his oxygen levels to remain high (without oxygen support). Pray for any/all infections to be eradicated from his body. Pray for him to be able to return to SRAL and receive even further extensions for continued therapy. Pray for strength for Christy. She is staying round-the-clock with Baylor at the hospital. Thank you for all your prayers and support. Baylor was admitted to the Shirley Ryan Ability Lab in Chicago, IL on Monday, May 14th and since his arrival, he has shown some progress and as is common – there are good days and other days. The facility, doctors, therapists, nurses, and therapy sessions have been AMAZING! We could not be more pleased and thankful. We are also humbled by all the prayers and financial support that has made this possible for Baylor. In fact, our entire family was able to be together in Chicago this past week. As of today, they have given us a discharge date of Thursday, June 14th. While we are extremely thankful for the nearly five weeks of therapy, we are praying for an extension. If Baylor is able to stay several more weeks, he will be able complete all the medicine and therapy trials that are available at SRAL. In addition, we are completing home modifications for Baylor while he is away, and they will not be completed by the 14th. Pray for the Doctors and Therapists, as they meet this week to make their final decision. Pray for no insurance issues. Pray for Baylor to continue to show progress in his therapy. Let me begin by apologizing… It has been four months since my last website update on Baylor. The reason for the delay is simply that we have been on such a roller-coaster of ups and downs since my last post. For this reason, I was never quite settled on exactly what I should post (I did try to keep folks informed through Twitter however). Well, today I know exactly what to post! In January, we were able to take Baylor to the Shirley Ryan Ability Lab in Chicago, for an evaluation. Just prior to us leaving, Baylor developed what we thought was a simple cold, and the doctor gave him some antibiotics and felt he was OK to travel to Chicago. When we arrived in Chicago, the temperature was in the teens, the wind was 20+ miles an hour, and it was snowing. Needless to say, it was not ideal weather for Baylor. His cold symptoms continued to get worse; however, he was able to push through his strenuous evaluation (see previous update). By the time his final evaluation was complete, Baylor literally had nothing left to give and was nearly lifeless. However, as sick as he was, Baylor fought through his pain and somehow did amazing throughout the testing (very physically demanding). We felt good about how well he did, and the next day we headed back to Murfreesboro. After driving all night, it was now evident that Baylor was extremely sick. When we finally arrived home, we placed him in his bed and spent the entire night watching his vital signs worsen and his nose bleed become unstoppable. In the early morning hours, we took Baylor to our local ER. It was extremely busy (flu season) and took quite some time for Baylor to finally be evaluated by a doctor. As soon as he looked at Baylor, he told us there was nothing they could do, and they immediately put us on a helicopter (Life Flight) to Vanderbilt. Long story short; while at Vanderbilt, we learned that Baylor muscled through his Chicago evaluation with only one portion of one lung and basically no use of the other. In addition, by the time we made it to Vandy, he had lost most of his blood, had almost no platelets, little lung capacity, extreme pneumonia, and a life-threatening bacterial infection. For these reasons, Baylor was on and off a ventilator 3 times during this stay, and received multiple blood and platelet transfusions. Well, after 3 weeks of touch-and-go (and MANY prayers), Baylor was released to go home! In typical Baylor fashion, he worked hard once home and began to again make progress in his therapy. Oh, I failed to mention… While Baylor was on a ventilator at Vandy, we received a call from Chicago saying that he had done amazing and they wanted to get him into the program ASAP. We were hesitant to let them know his situation, however we called immediately to inform them of his new situation – They were amazing and simply said that he had an open door as soon as he regained his strength/health. So then came March and Baylor once again ended up back at Vanderbilt, back on a ventilator, fighting an infection, and suffering from pneumonia. And, once again, he fought through (no quit in this kid), and by the end of April was once again making strides in his therapy. We have once again been in communication with Chicago. On Wednesday of this week Baylor’s case was taken back to the approving doctor to consider admission. Later that day, I was told that he had been approved and was being submitted for scheduling. Late the next day (Thursday), I received a call from their scheduling department and……….. They are tentively scheduling him to arrive MONDAY, MAY 14th!!! What exactly does this mean and what can you do? 1. Pray that Baylor remains healthy (bad allergies right now). 2. Pray that our insurance approves. 3. Pray that we are able to get him safely transported to Chicago. 4. Pray that Baylor will get his strong cough back (it has become weak). 5. Pray for NO setbacks. I realize this is a tremendous amount of information (and doesn’t scratch the surface of all that has happened since January), however I feel confident I will be able to share more frequent updates in the days/weeks ahead. Thank you again for all your prayers and support! If Baylor were to only look at what he has lost, or all that he has been through, who could blame him for quitting? He continues to press on, to strain and grind daily, to discover all that God has in store for him. Fight with Faith! Quitting is easy – anyone can quit. As you read through Paul’s letters in the New Testament, you see a man who constantly wanted to quit – to leave this world and be with Jesus; but God had a greater plan. Though, like the cross for Jesus, God’s plan was certainly not the easy way out. Many are familiar with the Christmas story of the Magi (Wise Men). While it is unclear exactly how many of them came to see Jesus, and we are not certain as to when they arrived, it is stated that they brought gifts of gold, frankincense, and myrrh. We are taught these are the richest gifts that a king could be offered and they are symbolic: gold – Christ’s deity; frankincense – His purity; myrrh – His death. While I believe all this to be true, I also believe there to be a very practical explanation as well. The text tells us that after the Magi left, Joseph was instructed to take Jesus and go to Egypt – where they stayed until the death of Herod. While we don’t know exactly how long he stayed, we do have a good idea of how their stay was financed – through the gifts of the Magi. Why do I share this today? God had a plan for salvation since the beginning. Matthew references Hosea 11:1 (which is also a reference to Exodus) that Jesus would be called out of Egypt. You see, hundreds of years before Jesus was born, God had a plan that He would be sent to Egypt. God then provided the means in which they would be sustained during that time – through the gifts of the Magi. This of course was to fulfill God’s ultimate plan of salvation for me and you today. So, what’s the point? God has a plan. Sometimes it doesn’t make sense to us, but we trust in His plan. Look at how things started out for Jesus – parents shunned, born in a feeding trough at a stable, corporate murders are issued in order to kill you, forced to leave your homeland… and yet today we see how God’s plan unfolded for us, some 2,000 years later. So, I am encouraged and I hope that you are too – God has a plan! After more than a year of trying to get Baylor to the Shirley Ryan Ability Lab in Chicago, we leave today! I didn’t understand our initial rejections, but now I look back and see God’s fingerprints on every little detail. Not the least of these is your financial support – 100% of any and every expense has been provided. While we are told that he only has a one-day evaluation and to expect to be sent home with no guarantee of a return visit, we are praying and believing for something much bigger. It is our prayer that Baylor will be admitted into the “Shirley Ryan Ability Lab Inpatient Rehab Program.” We ask that you join us in praying and believing for exactly this. In a recent iPad message, Baylor told Christy that he wants everyone to know that “iworkeveryday”. He wants you all to know that he is pushing and working hard every day. Our entire family is completely overwhelmed and extremely thankful for all your prayers and support. Baylor has been struggling with congestion in his lungs; however, he seems to be much improved today. He has experienced multiple seizures including Christmas day and even this morning – while we hate to see the seizures, we are also aware they are proof of brain activity and possible healing (takes a little rain to get the rainbow). Please pray for our family as we are apart for a few days. Pray for our safe travels – specifically that Baylor will not be exhausted and we can work out the bed issues. A few months ago, we were approached by a friend who had already planned to have a non-profit fundraiser; however, the ministry she was supporting was closed. She had heard about our desire to get Baylor to Chicago for treatment and asked if we would allow Baylor to be the beneficiary instead. The event was called “A Night Among The Stars” and featured a silent auction, song writers concert, as well as a financial support campaign. We agreed and honestly didn’t give much more thought to it. A couple of months later, she contacted us again and shared with us that the support from the community (local businesses, MTSU, schools, churches, individuals, etc.) had been greater than anything she could have imagined. Then just a couple of weeks before the event, a local cheer coach that was sponsoring a basket for the event, had another idea. She reached out to the school board and several local schools and promoted “Be The Change”, to coincide with “A Night Among The Stars.” She asked school-aged students to simply bring in their spare change. Well, the students went far beyond! In fact, I heard multiple stories of kids literally giving their Christmas money for Baylor’s cause. Now I ask you; how can we possibly say “thank you”? Truth is, our thankfulness will never be sufficient for your love and sacrifice. This community, through both events, raised just over $80,000, which completely removes all medical financial burdens at this time. You have truly been God’s hands of blessing to us. When we were first contacted about the event, we told Kristi Miller (organizer) that our goal was to go to the Shirley Ryan Ability Lab in Chicago; however, we were originally rejected and were currently waiting to hear back from our second attempt. A few weeks later, we got the call – Baylor had an appointment for an evaluation sometime in Feb/March. News Channel 4 ran a story prior to the event. During the interview, Christy and I shared that Baylor was in need of a healthcare advocate. A local neurologist saw the interview and felt lead to contact us. She agreed to help with Baylor’s medical care and actually knew some people at SRAL, whom she immediately contacted. They told her they would try and get his appointment bumped up, but no guarantee. Also, this week, I was called as Senior Pastor to one of the greatest churches on the planet – Northside Baptist. Our church family has been such a consistent blessing throughout our tragedy. **Murfreesboro is blessed with many great churches! By the way, this is an EXTREMELY brief overview of all that God has done in our lives since my last update. Simply know this: In a day where most headlines and news stories are filled with evidence of how wicked our world is, and how bad mankind has become; the Bramble family has seen nothing but the good in people. We are so blessed by our community and our God. I commit that we will do everything within our power to use your generosity in such a way that Baylor will one day be this world’s greatest ambassador of love and hope. Receive more frequent updates by following me on Twitter (@PastorBramble). It is hard to believe it’s been two months since my last website update for Baylor. During this time, our family has been extremely busy – and Baylor is no exception. Today marks the two-year anniversary of Baylor’s injury. This time two years ago, our family was excited and preparing to travel to Warren County to watch Baylor and his teammates play a high school football game. We had no idea how our lives would forever change that very night. While the journey continues to be difficult, God continues to reveal Himself through both encouragement and comfort. So today is a day of mixed emotions. It would be easy to be sad and depressed today, as we are forced to remember that night on a football field; however, we must choose to also remember the middle of that very night and the desolate words of doctors while just praying that Baylor would once again open his eyes. And so as we choose to also remember that time, we are able to rejoice in all that God has done and will continue to do. Baylor has recovered well from his most recent surgery (previous update). In fact, he will resume 100% of his therapy this week. We continue to see improvements with his participation during his therapy sessions. We applied once again, to get Baylor admitted into a therapy program with the Shirley Ryan Ability Lab in Chicago (formerly the Rehab Institute of Chicago). Please pray for God to prick the hearts of those in Chicago who can make the decision to admit Baylor for treatment. Please continue to pray that every brain connection will be made perfect. Please continue to pray for both voluntary movements as well as Baylor to speak once again. First of all, thank you so much for your support and prayers, which made our recent trip to Florida possible. The therapy with Ken Bryant was very successful for Baylor! He was able to gain some new movement with his arms and legs, and he gained the ability to hold his head up unassisted. While this may seem like small gains; they are some of his biggest, in quite some time. Unfortunately, when we returned home from Florida, Baylor became very sick. In fact, it has only been in recent days that he has regained his strength and stamina; which allows us to fully resume the new therapy that Ken Bryant began in Florida. On a good note – we have seen some incredible movements (though not consistent) over the past week. Baylor’s head control is increasing, he has shown his highest level of participation with his FES bike, and at times he is able to participate when I sit him up (he actually pulled me over once). Please continue to pray all his movements will grow stronger and more consistent. Today, Baylor will have a couple of small procedures to his throat and mouth. This surgery should give him better health as well as more comfort while swallowing and attempting to talk. The actual procedures should begin at 3:30 pm. Please pray for perfect procedures, no issues with the anesthesia, no infections, a perfect recovery, and more progress following. **We were unable to post updates during the FL trip on the website; however, I did post daily updates and even a video clip on Twitter (@PastorBramble). Baylor continues his daily fight & faith. We are very excited about some improvement we have seen recently during his recent therapy sessions. This includes: moving his right foot when told to kick a large ball, pulling his head and shoulders forward while I pull on his hands and ask him to try and sit up, and even some slight participation during his underwater treadmill therapy at MTSU. We were also able to take a family trip to Gatlinburg for a few days. This was our first trip as a family since Baylor’s injury. Though it was not without its difficulties, we were able to have a great time and Baylor communicated (via iPad) that he really liked going to different places. We are also VERY excited to share that Ken Bryant PRS has agreed to attempt treatment on Baylor. Ken practices reflexology and has had incredible success in working with people who suffer from paralysis due to spinal cord injury. Ken has agreed to perform a two-day trial with Baylor and, if successful, he will work with him for the entire week. Baylor has had no seizures since my last update. We were able to take a small trip to Gatlinburg last month. Baylor has shown some improvement with his voluntary movement. Ken Bryant has accepted Baylor for a trial treatment (we usually get rejected). Please pray for Baylor’s upcoming treatment with Ken Bryant. Our two-day travel with Baylor – Ken is located in Largo, Florida. Pray for bedding – sounds crazy, but one of biggest hurdles while traveling and staying away from home is not having our hospital bed and united mattress. Pray for Baylor’s health, strength, and progress prior to our trip. Pray for Ken Bryant – that God will use him as His healing hands. Pray for an immediate response from Baylor (if responsive within first two days, he will be able to continue treatments). Pray for responsive movements to return to Baylor. We will leave for Florida on Friday, July 21st and return on Sunday, July 30th. I will do my best to post updates throughout our trip. It is often asked, “Does God hear the prayers of unbelievers?” The short answer is always “of course.” I know this, because when I was lost, I cried out to the Lord and asked Him to save me – and that He did. Not only did He hear, but He also delivered! So for anyone, whether lost or saved, who comes to the Lord with a heart desiring God’s grace and mercy through salvation; rest assured, He hears you. We are to keep in mind though, that God knows our heart. Beyond a call for repentance and salvation, for the believer God knows exactly the motives of our requests to Him. Therefore, remember as you approach God’s throne in prayer, to have a pure and sincere heart. And let us never forget the Privilege that Prayer is. The Creator of the heavens and earth, the King of kings, the Lord of lords, the great I AM gives you His ear whenever your heart genuinely cries out. Baylor recently spent four days in the hospital. This was due to developing pneumonia. Doctors feel a combination of allergies and swallowing difficulties (drainage & eating trials) led to him developing the pneumonia. By the time we reached the hospital, Baylor was hardly breathing and his oxygen level was at a dangerous low. Fortunately, St. Thomas Rutherford took immediate action when we arrived (treated Baylor like a celebrity) and within a few days had him on a path to recovery. Though the week following has been difficult, he seems to be doing much better today! Baylor was not only able to attend his Senior Prom, but he was accompanied by an incredible date and host of friends. It was a long day/night; however, his being there once again defied all reason. 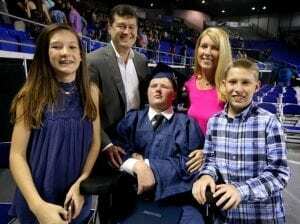 Just this past week Baylor was able to participate in his Senior Class Graduation! 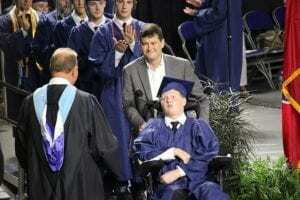 He was honored by both his principal as well as his student body president (and close friend). In addition, Baylor received a standing ovation from everyone in attendance (including faculty & students). That moment encapsulated the power of God, the support of a community, and the impact his life is making. We are excited to report that Baylor has not had a seizure in the past three months. We have noticed an increase in Baylor’s ability to vocalize (produce sounds). This mostly comes during extended stretches, following yawns, or due to pain. Regardless, we thankful to hear his voice and know that his vocal chords are working. Therefore, we ask that you pray for him to progress from vocalizing to verbalizing (turning sounds into words). Baylor has maintained a peaceful and hopeful spirit since his injury. Please pray he will continue to rest in God’s peace and work in God’s strength. Please continue to pray for purposeful movements in his arms, legs, head, as well as trunk control. 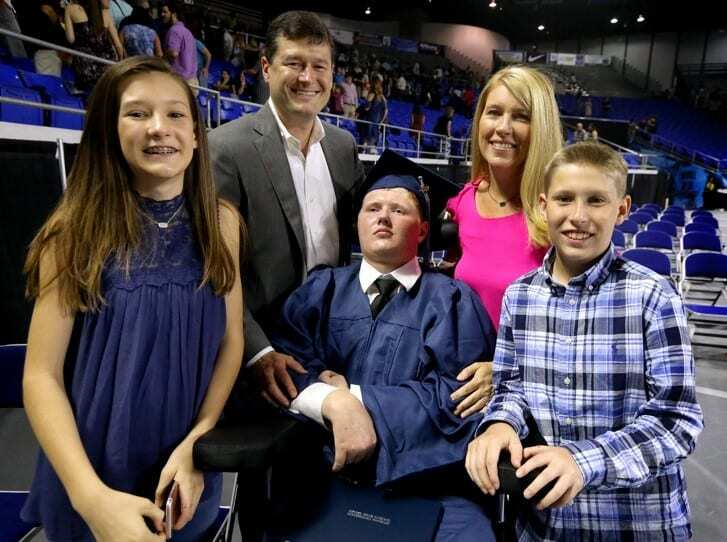 Yes, Baylor did attend his high school graduation; however he is not yet able to receive a degree (and certainly not a college degree – as stated on TV). But we appreciate the optimism!!! Unfortunately, the recent news report was true. Attorney Andy Allman took 100% of the proceeds from the sale of Christy’s father’s home, following his death. It was also reported that he then used those and other funds for a lavish lifestyle which included travel throughout the US and Mexico with his friends and wife. Once all funds were depleted, he then filed for bankruptcy. I can’t fathom what kind of people could possibly do this, however it is a reminder of the fallen world (and broken legal system) in which we live. Though they considered Paul as their church planter (his first church in Europe); it is God who established the church. Though their work is difficult; God will give them both strength and success. Though he was not currently with them; God was. Though he would soon leave this earth; God would never leave them – His plans continue until the return of Christ. The word “confident” in verse 6 means to be sure, certain, and convinced. Paul was able to have a spirit of peace, because he had a steadfast “confidence” in God – His strength, His plan, and His power. Paul knew that regardless of how difficult circumstances can become, God’s works will always succeed. This is still true today. Regardless of circumstances, we must remain confident in God’s plan. For us, we have no idea what each day may bring, but we are confident God’s grace will see us through and God’s purpose will be fulfilled. What an answer to prayer as Baylor was able to attend his high school graduation! In February, Baylor unfortunately suffered from multiple seizures, several of which were less than 24 hrs apart. While they often last nearly 10 minutes each and are very scary to both Baylor and us, we also try to look at the positive. We feel that seizures, while difficult, are part of the healing process. If his brain were not trying to fire signals, there would be no seizures. As I have said before, this journey is like a roller-coaster with many ups & downs. We are believing that with every trip down to a valley, we can climb to even greater heights of healing. One lasting side-effect of Baylor’s first seizure is that his body struggles, at times, to regulate his temperature. His typical temp is now 96-97° and it sometimes drops all the way down in the lower 80’s. Home Renovations are FINALLY nearing completion; however, due to some issues with previous work, we must add a new project. We look forward to finally having a completely functional house for Baylor and the entire family. Since my last update, Baylor now receives in-home therapy (PT/OT) through the Rutherford County School System. This has been an incredible blessing and the therapists are some of the best we have worked with. In addition, Baylor was accepted for a research project through MTSU’s Exercise Science program. With this, he receives underwater treadmill therapy once per week. He really enjoys this therapy and while we can only see very slight progression, we are convinced that he will make great strides – literally! We continue to be amazed at Baylor’s faith. He continues to give us (and his friends) messages of HOPE & PEACE through his iPad. Baylor has communicated (both with iPad and with expressions) that he can now taste and smell at times! Baylor received the Courage Award from the National Football Foundation. It has been nearly three weeks since Baylor’s last seizure. We continue to be blessed by the support of this community. Now that Baylor has some taste and smell, we ask that everyone join us in praying specifically that he will be able to both EAT and SPEAK. Many have asked about the proceeds from the sale of Christy’s father’s home. Unfortunately, the attorney who took the money has yet to offer any restitution or remorse. This man is obviously very disturbed and far from God. Please pray that he would come to know Christ. Please pray for Christy’s & my time management. That is for us to be able to give Baylor everything he needs, while still giving Brady & Macie the time and attention they deserve as well. In addition, please pray they would only grow closer to the Lord through this journey. When we are tired, busy, etc. it becomes an “opportune” time for Satan to attack (Luke 4:13). Please pray that, though we know Satan has and is attacking our family, we will be able to stand strong, persevere, and be a light. Due to Baylor’s rare and unique condition, we do not have one specific “go-to” doctor for all his needs. Instead, he has individual doctors for specialized care (Pituitary, Seizure, Rehab, etc.). This makes it difficult to know who to contact for medical issues, and sometimes there is no one to contact due to his rare condition. We understand that it is not necessarily the fault of doctors, rather the reality of a medical injury that goes beyond most medical knowledge and crosses over from one medical field to another. Please pray for his stability (good temperature, no seizures, no sickness) and we also ask that you continue to pray that he would gain enough recovery that he would be accepted into the Rehabilitation Institute of Chicago. RIC specializes in research and rehab for brain injuries similar to Baylor’s. We have tried once before, but due to a combination of insurance, lack of purposeful movement, and doctor assessment; they did not accept Baylor. Pray that Baylor is healthy and able to attend his prom next month. Throughout this past year and a half – literally since day one; God has given us peace through our hope in Him. In nearly every prayer, we profess that hope. That doesn’t mean that we have not experienced times of doubt, hurt, anxiety, etc. But even in the most difficult times, though we may fail (and I certainly do), God has always given us hope; because in all circumstances He is able! A Confidence of God, through Faith in Christ; which is evident in times of uncertainty. It is when you have every reason and excuse to believe what is seen and heard, but cling to that which is eternal. As a Christian, it is impossible to separate Hope and Faith. You cannot have one without the other. In fact, to not have one is to not have either. This is true, because our Hope is found in the object of our Faith – Jesus Christ, and Him alone! Baylor’s story was featured on FOX 17 last night after the Super Bowl! Great piece! Here is the latest update from Pastor David Bramble. We were blessed to celebrate the second birthday that Baylor was never (medically) supposed to see. It was a great weekend with friends and family at our home. Thanksgiving was likely our most Thankful ever! I am reminded how often I have told disgruntled people “the best way to appreciate and be thankful for your job, is to experience unemployment”; or “the best way to truly be thankful for the food you have, is to go hungry.” Well, for us, we were able to be more thankful for life than ever before. When you are told that your child will no longer have life – you are thankful for every breath. We celebrated Thanksgiving in our home (hospital the previous year) with all our children. Thankful parents! December began with Baylor’s first seizure. For people who suffer from TBI, it is not uncommon to have seizures. It is surprising that Baylor made it an entire year without one. However, this seizure was a pretty big setback. It would be several weeks before he would recover to the point he was prior to the seizure. Certainly, our highlight for December was being home for Christmas! Just like Thanksgiving, we spent the previous Christmas in a hospital as well. Our entire family was able to be together, go to church together, and simply enjoy Christmas at home. I know my highlight was our Christmas day devotion, as we all gathered in our living room and around God’s Word. Unfortunately, we were on the News again last night; however, this time was primarily for all the wrong reasons. We are very thankful for how respectful Channel 4 has been to our privacy and how well they have consistently represented Baylor’s story; however, due to time restraints in the broadcast, the news report was unable to give all the details of what transpired which has led to questions from those of you who follow Baylor’s story and, more importantly, pray for Baylor. Hopefully this update will help answer many questions that you may have. Channel 4 shared that a Hendersonville attorney, Andy Allman, had been arrested on one count of theft between $60,000 and $250,000 for legal/ethical/financial misconduct as an attorney in that he mishandled funds belonging to client(s). Whereas we were not directly involved in the initiation of this criminal charge, we do not have any further knowledge about the specifics of the incident(s) that led to this arrest. However, as disclosed in the broadcast, the Bramble/Gregory/Brown families were also clients of Mr. Allman and were unfortunately also victims of his illegal and unethical conduct. First, let me say that we have been dealing with this issue for nearly 6 months and apparently like other people, our efforts to recover misappropriated funds have not yet been successful, but we purposely have not publicly shared the details of this situation, as we desire for all prayers and attention to remain on all that God is doing with Baylor’s healing, not this situation. In addition, we did not want to bring any undue accusations on Mr. Allman, and of course, we had hoped that he would make things right. It was not until we learned the TBI had raided his house and arrested Mr. Allman that we agreed to an interview. While Baylor was weaning off the ventilator at Select Hospital in Nashville, we received a call that Christy’s father had unexpectedly passed (12/4/15). Just a few days later, we received a call that Baylor had been accepted in the Shepherd Center in Atlanta, and that we would be transferring to GA that same week. While we were in Atlanta, Christy’s sister was dealing with all her dad’s documents/taxes/burial arrangements/house/bills/etc. It was difficult for us, because we were not able to help her with the tremendous load that she was dealing with. In addition, Christy had not even had opportunity to grieve her father’s passing (there was a tremendous amount of work involved in our moving to Atlanta with 2 other children still in school in Murfreesboro). Amid all that, Christy’s sister was in contact with an attorney who shared that his own brother had spent a significant amount of time at the Shepherd Center and that he would like to help us out, by taking care of the necessary probate filings and closing of their father’s home. In August, the home sold. This seemed to be some healing closure. While Christy’s dad could not be there to comfort her during the most difficult time of her life, he was able to give her a portion from the sale of his house, which would help with her having to quit her job and everything she would be facing in the years to come. It was somewhat a gift of joy in a time of sorrow. In November, Channel 4 ran a story on a local attorney who was recently suspended for alleged misuse of client fees. Yes, it was our attorney. We were immediately concerned, because Christy’s sister had communications with Mr. Allman over the past few months, and he never shared that he was suspended. Obviously, we increased our communication, and he continually assured us that everything was fine. At that point, we contacted another attorney, who also felt everything was fine, but agreed to take over our probate handlings. After a few weeks, he was able to get Mr. Allman to issue him a check for the amount their father’s house sold for (it was originally issued to the estate and deposited into Mr. Allman’s trust account, as probate was not yet completed). Unfortunately, within a few days the check bounced. And now we wait. We are constantly being asked “Are you mad?”. We’re obviously upset, but more hurt than anything else. Christy’s father lived a very modest life. In fact, the family donated nearly all his belongings to a local ministry that hopefully they can eventually sell for a very small amount. However, he did have a house, and though it was very old and needed a lot of repair, it sold very quickly (thanks Bob Parks). This is where the hurt comes. It’s not at all about the money. Our lives and ministry has never been about that. We know that God has always and will continue to bless us, and that anything we have is a gift from Him. It hurts that a man lived a long and modest life, in part to give his children at least a small inheritance, and that is what was taken not only from us, but also from him. Please know that our family is just fine. In fact, we are quite blessed. That is not just a humble statement, it is the fact. Pray that Baylor will be able to speak very soon. Pray for Baylor to make continued progress with neck & trunk control. Pray also that Baylor can regain purposeful arm & leg movement. Pray that our home therapy will be successful (this made possible through people helping to purchase the necessary equipment). Pray for Mr. Allman (can’t begin to imagine his family’s hurt either). 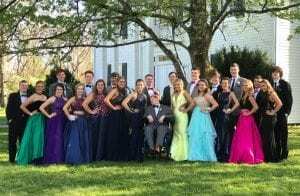 Baylor recently typed that he wanted to attend his Senior Prom. Not only that, he wanted to take a date. And not just anyone. He specifically typed out who he wanted to ask. And she said yes! Maggie Huffman – beautiful inside & out. 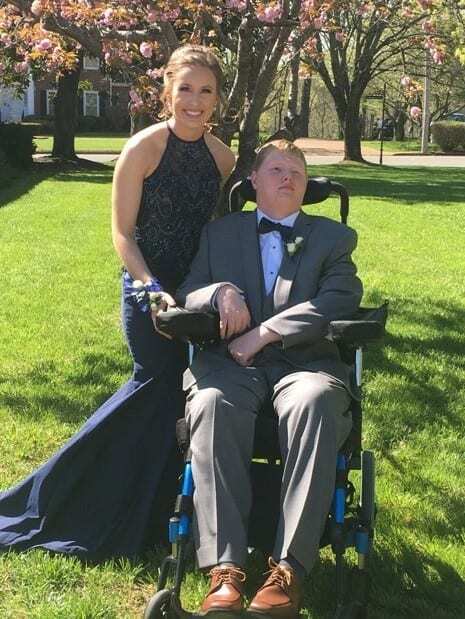 The boy that was told he would have no quality of life; now attending his Senior Prom with a beautiful date. Guess not everyone’s definition of quality is the same. Thank you for your prayers for Baylor today. He and the family are headed home! During therapy Wednesday afternoon at Vanderbilt, Baylor had a major seizure lasting 6-7 minutes. They transferred him to the Emergency Room where he soon stabilized. As he was being prepped for discharge last night, his temperature dropped, and so he was kept overnight. His temperature remains low this morning, and doctors are unsure what is causing it. The family cannot filed visits or calls, but asks everyone to continue to pray for Baylor. As you may know, yesterday was Baylor’s 18th birthday. While it certainly was not the celebration that we imagined before his injury, it was far greater than anything we could have imagined at this time last year. In fact, November 6, 2015 was likely one of Baylor’s worst days. So, as we compare this year to last, it is amazing to see all that God has done. While daily progression is difficult to see; yearly is amazing! I can’t begin to adequately thank everyone for making his birthday so special. He received countless cards, gifts that will remain in his checking account until he is able to use them (and he will), our subdivision lined with blue balloons, a signed football from the University of Tennessee, a very special gift from @JacobTamme, as well as a couple of gifts that will help us to complete his therapy room at home. In addition, his birthday was on Sunday, and he was able to be at church where many people, donned with #Pray4Baylor shirts, wished him a happy birthday and continue to pray for him. So today marks the One Year Anniversary of Baylor’s injury. It’s difficult to explain all this day represents. On one hand, research suggests that recovery is very difficult/unlikely beyond the 1 year mark. On the other hand, medical knowledge also suggested that Baylor likely had hours to live (Nov. 2015), that if he survived he would be deaf (or at least unable to process audio), on a ventilator, have no memory, and no mental capacity. In addition we were told that neither Baylor, nor our family would have any quality of life. So, while we could be hurting and upset that he is still not able to move, talk, or eat; we celebrate that he is home, he can hear our voice, he can see his family and friends, and he is communicating through an iPad. And as far as that whole “quality of life” thing… Well, if you define quality of life by the impact that your life has on others, well I would say Baylor’s is hard to top. If you define the quality of parents’ life by the impact their children have on this earth and for the Kingdom; well then, ours is pretty hard to top as well. What a wonderful story Channel 4, Nashville did this week on Baylor! Take a look below, and please continue to #Pray4Baylor. God is doing amazing things in and through him. If you are unable to view the video above, use this link. We have been very busy at home with Baylor’s therapy and regimen, as well as Brady and Macie returning to their school & activities (not to mention home alterations). Please know that we continue to feel the prayers of many, and see their results. Since my last update, Baylor has undergone a small procedure to aid in his therapy for chewing and eventually talking. He has also received a very good report from his eye specialist – stating that he can see significant improvement and that must be a result of “brain healing”! 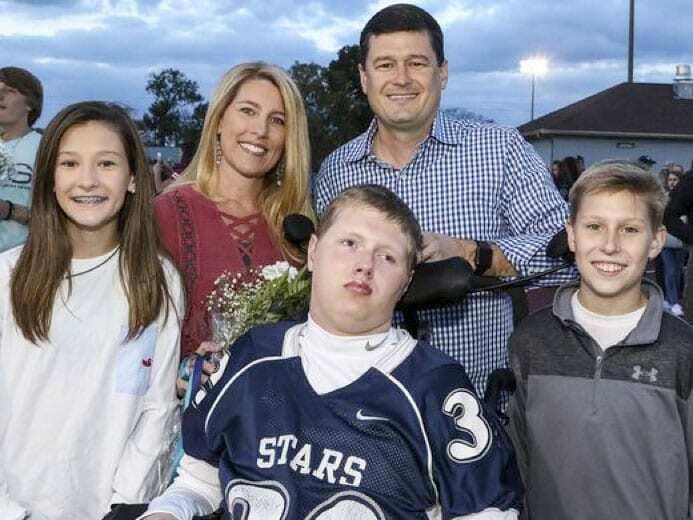 Baylor was also able to attend Siegel High School’s football home opener, and while it was a loss on the scoreboard, it was a total win for Baylor and our family. Many of you already know that we had another crazy event – our 2011 Honda Pilot’s engine caught fire while Christy was transporting SMS Cheerleaders to their game. Fortunately, Christy acted quickly and no one was injured. The car was a total loss. However, it’s just a car, and we are thankful that everyone was OK. Funny how MAJOR life events can put small ones into perspective. Again, we cannot thank you enough for your prayers. Believe they go directly from your mouth, to God’s ears, to our hearts. Baylor is working hard to speak again. Pray new brain connections will be made in order for him to speak. Pray for him to get stronger, as we push him harder during his therapy sessions. Pray for our family (strength, perseverance, and patience). A few weeks ago, we noticed that Baylor seemed to be more relaxed and peaceful than he had since his injury. One day, Christy asked him about it, and he acknowledged (via iPad) that he was. She then asked if God had been speaking to him, and he acknowledged (via iPad) that He had. Christy then asked Baylor what God was telling him. Baylor then typed “trust”. Christy asked Baylor “so God is telling you to trust Him, and that’s what you are doing?” “YES”. A few days later, Christy and Baylor were alone and communicating with the iPad. Christy became tearful at one point as she was speaking to Baylor and he then typed “takemyadvicetotrust”. Fast-forward a few more days. We are really struggling with finding therapy for Baylor that can keep him improving. Between insurance, financial, location, and other limitations, we feel as though too much time is passing without resolve. We have been praying about purchasing equipment (since proper outpatient is not an option) to do home therapy and finding a facility that will allow Baylor to participate in either inpatient or outpatient therapy and testing. Over the past week, we have received gifts, encouragement, and direction that gives us hope for all that God is doing and will continue to do. In fact, we actually now have some equipment on order! So I just wanted to share a few things. First, that God is teaching Baylor to Trust, and he, and many others are teaching his parents to Trust. Secondly, to say “thank you” to all those who are making it possible for us to get therapy equipment. Thirdly, to ask you to continue to pray that Baylor will continue to improve. We are still praying to hear his voice. We are still praying for purposeful movements. We are now praying that he will be admitted to the Rehab Institute of Chicago for intensive therapy/study. Pastor David updates us on all that’s happened in the last month and gives us two specific prayer requests. It’s hard to believe that it has been an entire month since my last (website) update. Baylor has been home now for more than a month, where he seems peaceful and has been able to gain all his weight back (would love to plug momma’s cooking here but…). He is now stronger and more alert than ever. He seems to have even hit a bit of a growth spurt lately. His communication with an iPad has increased significantly, as has swallowing and even his eye sight. He has recently communicated that he enjoys watching movies – and is able to do so! We are excited to see all God is going to do in the days ahead. Unfortunately Murfreesboro does not offer the outpatient services that Baylor desperately needs. Though there are some (limited) facilities in Nashville, the process of getting him there could likely negate the short windows we would be allotted. We are, therefore, praying about home equipment options and/or further out-of-state programs. We are praying daily that God will allow Baylor to speak again. He has communicated (via iPad) that his inability to speak is his greatest frustration. He desperately wants to speak; we desperately want to hear his voice again; God alone can make this possible. Today, Pastor David Bramble gives us an in-depth look at both the progress Baylor has made and the challenges he faces daily. Let me begin by reiterating that Baylor has improved exponentially, and much of the confusion is due to the fact that it is baffling he is still alive – but he is! Baylor completely breathes on his own and is now opening both eyes. We are confident that he can see out of his right eye, but are not certain about his left (likely he cannot). He requires all food and medicines to be given through a tube, with the exception of occasionally swallowing ice chips or water during speech therapy. He is also immobile, meaning that he is not able to purposely move any of his body, with the exception of occasional head turning and arm movement (with assistance) during therapy (bringing a cup to his mouth, using an iPad, throwing a football – his favorite) . While his eyes are open, he is not able to clearly track movement and his pupils do not react to light. He is still unable to speak and sounds from him are very infrequent. Baylor requires 24–7 care at this point, however, his vitals are amazing! His physical good health prior to his injury has helped sustain him, and he continues to be in great health (heart, lungs, etc. ), minus the brain injury. “So how does he communicate on an iPad?” This one is probably the most confusing. Baylor has a special stylus that wraps around his hand. His mother holds his arm and wrist upright, so that she can feel him initiate movement to the right or left. She can then help him to push one of two large boxes on the iPad screen. To give you an idea of how long it takes, Baylor’s last message began around 10am, and he was not able to finish until 7:30pm that same night (several naps in-between). To answer the common follow-up question: speech therapists at The Shepherd Center in Atlanta first introduced the iPad to Baylor, and he was able to correctly answer many questions to which they did not know the answer (Christy & I confirmed). So yes, it is him “speaking”. This update is not intended to be negative but to give a more clear picture of Baylor’s condition and specific/accurate information for prayers. He has come soooo far. God is not quitting, Baylor is not quitting, our family is not quitting! Doctors gave us days and then hours, nearly six months ago. Baylor is breathing on his own, opening both eyes, proving that he can see, hear, and remember; oh yea, and he is no longer even in a hospital. God has answered so many prayers, and we know that He will do even more. Our family remains strong and united. We have experienced conversations with Doctors that no adult, let alone child, should ever have to face. Yet through it all, Baylor’s brother and sister have handled this in a spiritually mature way that would shame most adults. We have been at some of the best facilities in the world with some of the best doctors, nurses, techs, therapists, etc. However, Baylor’s mother has proven to outshine them all! She is amazing and God has blessed us all through her resilience, love, attitude, and spiritual power. I have always assumed the role of Spiritual Leader of my home with humility; but I have truly been humbled to see that it is my wife and children that are the bedrock of our faith. If I am leading, it is from the rear, as I watch them walk their faith. I have to close with a final word of thanks to all the people, churches, schools, businesses, ministries, clubs, and municipalities that have prayed for and given to our family, throughout these past six months. You have been helpful and encouraging in ways that you could never imagine. Today marks 6 moths since Baylor's injury. 6 Months ago we prayed Baylor would make it through each night – He did! 6 Months ago we prayed Baylor would open his eyes – They are! 5 Months ago we prayed Baylor would breath without a ventilator – He does! 4 Months ago we prayed Baylor would be accepted at the Shepherd center in Atlanta – He was! 4 Months ago we prayed Baylor would be able to participate in therapy – He has! 3 Months ago we prayed Baylor would be able to breathe with a “capped” trach – He did! 2 Months ago we prayed Baylor’s pressure sore would heal – It did! 1 Month ago we prayed Baylor’s cranium surgery would be successful – It was! 1 Month ago we prayed Baylor would be able to breath without a trach tube – It’s gone! Seriously; How good is God??? Another great/miraculous day of therapy. Baylor was able to pull a cup up and swallow several times! We will bring Baylor home on Wednesday! Looking forward to having our entire family together again. Much has happened since my last update. We are completing home modifications for Baylor’s return and have been blessed with several contractors making this completion a priority. In addition, we have been blessed with businesses, schools, and churches that have given recent (and upcoming) prayer emphasis and financial support for Baylor’s recovery. I cannot adequately express how thankful we are for all the love we have received from our community. Baylor has shown incredible recovery from his recent procedures (cranioplasty & trach tube). In addition, Baylor has shown some progress with his therapy: some vocal sounds, once sipped from a straw, weight bearing, eye opening, etc. He is currently fighting off an infection and still healing from a small pressure sore. We appreciate continued prayers for his healing and specifically: Infection would be cleared – and no future infections, continued acceptance and grafting from his cranioplasty, and no more pressure sores. Also pray that he will continue vocalizing (sounds), will begin verbalizing (words), and that he will gain more purposeful movement. No more trach tube for Baylor! Procedure is complete and he is doing great. Baylor’s surgery went as well as could be expected – Praise God! While we ran into several issues at Vanderbilt and ended up leaving two days earlier than our doctor was aware, we were able to return to TrustPoint to continue his recovery. Most swelling has now gone down, and the pain seems to be easing a bit. It will be a couple of months before we know for sure, but everything seems to be healing perfectly. Thank you for your continued prayers. The peace that our family has can only be explained by the Grace of God. Baylor will have a scope tomorrow morning to look again at his vocal chords, swallowing, etc. Please pray the scope will show healing and the doctors will have wisdom in determining our next steps. We also ask that you pray Baylor will be able to continue his inpatient rehab with TrustPoint. I can’t say enough about the love and care he has received there. Pastor David Bramble updates us on Baylor this afternoon. In the morning we return to Vanderbilt, as Baylor is scheduled to undergo a craniotomy. This surgery is scheduled for 1:30pm CST and will replace the bone flap that was removed at his initial surgery in October. This is obviously a very important and serious surgery. We are uncertain about the recovery time, but feel confident this surgery will aid his continued healing. Please pray for wisdom for the doctors, surgeons, nurses, techs, anesthesiologist, etc. Please pray that Baylor’s body will receive (not reject) the bone and that there will be NO infections as a result of this new surgery. Pray for his time of recovery and that he will not get any pressure sores as a result of the time of immobility. Thank you for your faithfulness. You will never know how thankful our family is for each and every prayer that is lifted up. Baylor unfortunately got a pressure sore following his January surgery and also underwent a procedure on his vocal chords just days before we had to leave Shepherd Center. We were sad that we had to leave; however, we also knew that if God was closing this door, He would certainly open another. Indeed He did – we are now at TrustPoint in Murfreesboro. It is great to have our entire family in the same city once again. Not only is this a blessing for our family, but we are also certain that it will be helpful in Baylor’s continued healing. The staff has been incredible and Baylor seems to be responding well to his new environment. We ask that you would continue to both pray for Baylor & praise God for the healing that He has done, is doing, and will complete. Our specific requests are for his sore to be healed and his vocal chords to work perfectly. For those who follow my Twitter updates (@PastorBramble), you know that we have experienced several weeks of ups & downs. Through it all however, God has remained ever present, prayer partners have remained faithful, and Baylor has continued to show incredible strength. We are still uncertain as to how much longer Baylor will be able to stay at the Shepherd Center, however we should be there at least until the end of next week. Please continue to pray for all decisions during this time. 8 We do not want you to be uninformed, brothers, about the hardships we suffered in the province of Asia. We were under great pressure, far beyond our ability to endure, so that we despaired even of life. 9 Indeed, in our hearts we felt the sentence of death. But this happened that we might not rely on ourselves but on God, who raises the dead. 10 He has delivered us from such a deadly peril, and he will deliver us. On him we have set our hope that he will continue to deliver us, 11 as you help us by your prayers. Then many will give thanks on our behalf for the gracious favor granted us in answer to the prayers of many. Continue to pray for God’s healing for Baylor! Baylor’s surgery appears to have been effective and he has now resumed his therapy sessions. He has taken a slight step back with his breathing and swallowing; however, we are optimistic he will catch back up in the days ahead. We continue to pray for Baylor and give thanks for all the prayer partners. We are constantly praying for his complete recovery; however, we cannot forget to give thanks for all that God has already done. Miraculous is the only word that can describe where he is today – compared to where he was 12 weeks ago. We thank God for all He has done, is doing, and will do. We also thank God for all the people who are joining us in prayer for this miracle. Baylor will undergo a surgery this Friday at 1pm EST. The surgery is being done to help with his spasticity (muscle tone). Our goal is that within a week of this surgery he will show even greater response during his therapy sessions. Due to this upcoming surgery/recovery, he will not be able to have visitors this weekend, however please know that your prayers mean more to us than anything else! The phrase “taken to deep waters” is an idiom often used to describe when a person (or group) is being placed in a difficult situation. Luke describes a time when a group of fishermen had been fishing all night long, and caught nothing. After using one of the boats as a pulpit, Jesus said “Put out into deep water, and let down the nets for a catch.” (Luke 5:4) These men were “professional” fishermen that had worked all night long with no results. They were certainly tired, frustrated, and ready to go home and call it quits. Instead, they chose to obey the advice of a preacher/carpenter and go to “deep waters.” The results…well, they hauled in the greatest catch of their lives! Fishing in shallow water is much easier — you can see the fish, bait, structure, etc. Fishing in deep water is more difficult, because you cannot see what is below – it requires faith. Why did I share all of this? Because I feel that God has now taken us into “deep waters.” It has been 76 days since Baylor’s football injury. We have yet to hear a word from his mouth or receive an embrace from his arms. To say these times are difficult is an extreme understatement. We are tired, we are sad, we are confused, but we are certainly not without hope. I believe these are the days where our faith is truly being tested, and it is not easy. But we cannot and will not forget all that God has already done. We were told in the early days there was little to no hope for his survival and now we are at day 76. We were told that he would not be able to breathe on his own and yet we have not seen a ventilator in over 6 weeks. God has not sent us to, nor abandoned us in deep waters. He has carried us there and He is not letting go. And through it all, we continue to receive encouragement, prayers, and support from people everywhere. The last few weeks have been full of ups & downs. Times of encouragement and times of concern. Some days of therapy have seen responses and some days have none. His trach was capped off for several days, however a recent test result will prevent future capping (for now). He will now have a valve on his trach (still breathing on his own). A scope showed that his vocal cords are operating backwards (closed when breathing in) – this is due to brain damage. His muscles have been stiffening and he will undergo a corrective (invasive) procedure next week. Our family has been loved through this beyond measure. Through this, people have turned to God (some for the first time; some like never before). Did I mention 76 days, and he’s still with us!!! His vocal cord issue was discovered. He has had NO sores, infections, illnesses, etc. Baylor has had some ups & downs since my last update; however he mostly remains stable. His greatest improvement has come with his breathing. They have been “capping off” his trach – which means he is breathing 100% through his mouth/nose. His longest stretch so far has been 3 ½ hours straight. As I type this update he is capped and starting his third hour. Thanks to the kindness of a multitude of people, his brother and sister were able to have a great Christmas, as we were all together here at the Shepherd Center. We were blessed on the 23rd to be approved for an additional 2 weeks of therapy – HUGE thanks to Blue Cross Blue Shield of PA & Highmark Insurance! I cannot say enough about the care he has received here at Shepherd Center. The entire staff has been amazing and I am confident Baylor could receive no better care. Baylor will continue to be able to breathe with a capped trach. His next step would be a complete removal of the trach! He will continue to improve with following commands during his therapy sessions. Insurance will approve additional weeks of care/therapy here at Shepherd Center. That he will continue to be free of any virus/infection/sores – which would hinder his recovery. We continue to receive support from all over (Murfreesboro, McMinnville, Franklin, Memphis, Atlanta, Alabama, Florida, South Dakota, Romania, & Nigeria just to name some from this week). We remain amazed at all the love that is still in this world, and it is impossible to express the proper thanks that is due. Please know that your prayers are being heard by God and felt by the entire Bramble family. Here is the latest update from Baylor’s Dad! Today was a great day for Baylor. He had his most active response to therapy yet. He was able to move one arm and some fingers on command. In addition, he has continued to swallow ice chips and has maintained his weight. Please pray that he will continue to respond and gain ground every day. Additionally, please pray that his pupils will begin to respond to movement/light. While our strength is in the Lord; our endurance is fueled by your prayers. I cannot begin to understand or even explain the peace we have, except to say that we know the source. As His Word promises, we have been given peace that is both indescribable and unexplainable. There have been so many times that doctors and nurses have asked how we are so calm and even joyful – what an opportunity to share about our PEACE! In addition to Baylor’s injury, Christy’s father unexpectedly passed away just days before us leaving for Atlanta. I cannot begin to imagine going through a time such as this, without this peace that comes only through a relationship with the Father and through His Son. In addition, I cannot express how much we feel and appreciate your prayers. While God is the one who is carrying us through this difficult time, you are the arms He is using. I cannot say enough about the expertise, love, care, and attention that Baylor is receiving at the Shepherd Center. He has an incredible team of doctors, nurses, and therapists that are dedicated to his recovery. While we know that it will still take a miracle, we also know there is no better place for Baylor to be in order to receive it! Baylor is responding well to his therapy, however it is important to understand exactly what that means. His progress will likely be very slow. Someone told us it is similar to watching an iceberg move – it’s happening, but very slowly. He has no vent, or even oxygen support. He now has a smaller trach, with a valve that will allow him to begin to smell and create sounds, when possible. His muscles have had some reflexive responses, and he has been able to partially swallow an ice chip. Day3 @ShepherdCenter & we see the benefits of this amazing place.Baylor is gaining weight & showing some responsiveness. Thank U @Highmark! Baylor begins rehab therapy today at the Shepherd Center in Atlanta. Please continue to pray for a miraculous healing! One week off the ventilator. Thank you for your consistent & continual prayers. God has certainly heard your voice and answered our pleas. Baylor has now been completely off the ventilator for 5 days! This has been a huge and specific prayer request; because the ventilator trumps all other possible therapy, rehab, facilities, etc. Due to this success, he will be receiving a smaller trach within the next 24hrs. This will allow him greater control and comfort with his breathing. Please continue to pray for his breathing and that he will not get any infections or bedsores (he currently has neither). We do not deserve your prayers, but you’ll never know how appreciative we are for each and every one that is lifted up. Baylor has been off the ventilator for 3 1/2 days. We are told the first 5 days are the most critical. Thanks for your continued prayer support. Today is #33 in hospital. Baylor completed 24 hours off the vent [yesterday]. In fact they have taken the ventilator completely out of his room! God is good! On Friday, October 23rd, Baylor was sent via LifeFlight to Vanderbilt Hospital with a traumatic brain injury. Post immediate surgery and follow-up brain scans, the doctors gave little to no hope of any recovery. On his 17th birthday, November 6th, we were even told that he could possibly only have hours to live. After much prayer, we decided that neither Baylor nor God had given up on Baylor and, therefore, we would not either. Though we had been asking for (and overwhelmingly receiving) prayer for Baylor, we began to be more specific with our requests (Matthew 7:7-12, 18:18-20, 21:21-22; Mark 10:46-52, 11:24; Luke 11:9-13; James 4:2-3; etc.). We began to ask that people pray specifically for Baylor to begin breathing on his own. We also asked people to be persistent with their prayers (Luke 18:1-8). Today, Baylor will have a trial off his ventilator for 24 hours! We don’t know what the future or even tomorrow holds. What we do know is that God is good, He is able, and He is listening to our prayers. We know that God is using this time in our lives to draw us closer to Him. We know that Baylor is doing more for the Kingdom in a comatose state, than most do in a healthy lifetime. We know that we are thankful to all who are fervently and specifically praying with us for this miracle. my heart trusts in him, and I am helped. My heart leaps for joy and I will give thanks to him in song. Baylor was successfully off the ventilator for 18 hours yesterday. At 5:55am they took him back off & are going to let him try for 24hrs! AMEN! Baylor eclipsed 16 hours today off the ventilator! His father says he will go back on the ventilator shortly. We are thanking God for more answered prayers. Baylor made it all 12 hours off the ventilator today and will try for 16 hours tomorrow. Thank you so much for your continued prayers for Baylor and the Bramble family. We are all so thankful for God’s provision. Baylor made it eight plus hours off the ventilator yesterday. He is currently trying for 12 hours today. We praise God for answered prayer and ask you to continue to pray for him, that he will be able to meet today’s goal. Baylor successfully completed both four hour trials today. Tomorrow’s test will be one eight hour stretch off the ventilator. God is answering prayer. Let us continue to seek Him. Baylor completed both three hour sets successfully! His father says they will try four hours at a time tomorrow. Thank you for your continued prayers. Baylor did well during both two hour periods off the ventilator yesterday, and is scheduled to be off for three hours this morning and three this afternoon. We praise God for yesterday’s success and ask that you pray for the same today. Baylor went over two hours last evening breathing on his own. He began another stint off the ventilator at about 10:00 this morning. If all goes well, he will stay off for two hours now and another two hours this afternoon. 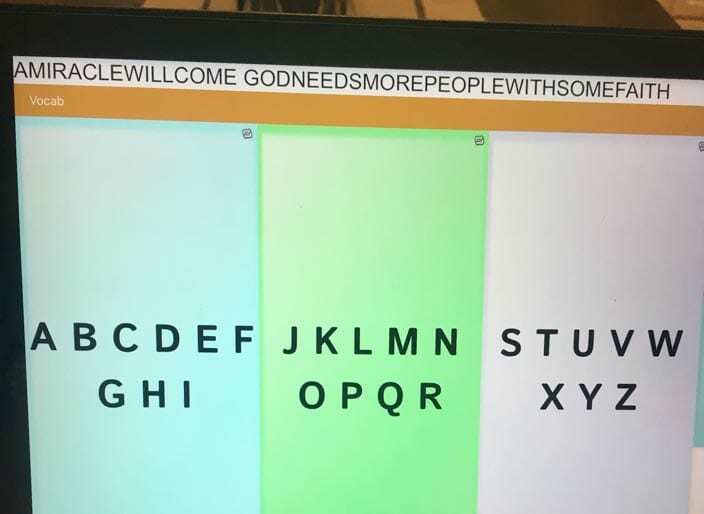 Please pray he is able to do that. Praise! Baylor made it through the entire hour without any assistance. Thank you for praying. From @PastorBramble: Baylor is beginning to try & wean off his ventilator. From 9:30-10:30am today he is completely on his own. Please pray that he breathes with no complications. Baylor was transferred to a skilled nursing facility in Nashville on Friday. There was no change in his condition over the weekend. The family thanks you for your continued prayers. Baylor has undergone two small procedures this week that were necessary for him to be transferred to a skilled nursing facility. Both procedures were successful and it appears that he will be transferred to a skilled nursing facility in Nashville at some point on Friday. He has once again begun initiating some breathing. The family would appreciate continued prayers for his brain recovery and specifically that he would once again breathe without any assistance. Baylor’s procedure went well yesterday. He has even begun to move his toes regularly (still not on command though). The family’s specific prayer for today is that he will regain his breathing. He has not been initiating his breaths over the past 24hrs. Baylor had a pretty rough weekend, but seems to be more stable today. His reflexes have returned somewhat and he will likely have another small procedure tomorrow morning. We receive emails, texts and tweets literally from all over the world, from people and churches who are praying for Baylor. Please continue to ask God for this miracle. We cannot and will never be able to adequately thank you for your support. Baylor’s condition Sunday was unchanged. His father, David, shared these Scripture passages from their family devotion today: James 1:1-27 and Hebrews 11:1-40. Baylor’s condition is unchanged today. Today is Baylor’s 17th birthday. Thank you to all who are praying for his recovery. Baylor’s condition is unchanged. We continue to find strength/peace in God. Baylor’s condition remains unchanged, however he is initiating all breaths. Words cannot express, and time does not permit us to convey, our thankfulness to the countless number of people who have prayed for and given to our family, during the most trying time of our life. We know that we have a long road ahead of us, but we take each step with confident faith that God has prepared the way. Please do not cease praying for a miracle – We believe! Baylor will undergo a small procedure this morning. Please continue to pray for him. Baylor’s MRI showed no improvement. The Brambles are requesting privacy for time together the next few days. Please continue to pray for Baylor. Baylor’s MRI took place at 3:30 this morning. The family should meet with doctors before lunch to go over the report. We will update as soon as we have more information. Looks like Baylor’s MRI will be 4-5am Sunday. Please join us in praying as we believe God for a miraculous improvement. Just left Baylor. He is moving his arms – though not on command – still his most movement since surgery. MRI will be early tomorrow morning. Baylor is scheduled for a second MRI at some point on Sunday. It could be as early as 12:01am. We need everyone to pray very specifically for a change from his first MRI. Pray it will show a miraculous improvement. Doctors could only attribute any change to the Hand of God. The family received a very poor (official) report from the MRI today. Baylor has not improved. Please continue to pray for him‬. Baylor’s condition remains unchanged. Yesterday’s MRI revealed no setbacks or improvement. David & Christy meet with doctors today to discuss his progress. They appreciate your understanding of their inability to field visits at this time. They have been deeply encouraged by your emails and text messages. Don’t quit praying. God is able! Bro. Ken just talked to David. He and Christy spent time with Baylor and the doctors this morning. Baylor has had some fever. They have increased his ventilation to make his breathing stronger and plan to do an MRI today. Please continue to pray for a miracle. Remember any/all updates will come via this page. Thank you for sharing. Baylor’s condition remains unchanged. Doctors told parents they are looking for “Baylor’s pupils to return to normal, and increase in purposeful movement with his body.” Please join us in praying for those specific things! Parents have several meetings with doctors today and tomorrow. So please know they appreciate your emails and text messages. They read them in their down time. They simply aren’t able to field visits, due to their schedule. Long sleeves shirts are being sold via Siegel High school ($15) to support Baylor and his family. Again, ANY updates will come via this page. Baylor has a nurse dedicated to monitor his condition. Every 2 hrs they do evaluate him. David & Christy were with him for the latest evaluation. There has been no change in his status: no improvements, no setbacks. He remains in critical condition. Doctors are simply observing his development over the next 24 hours. Family asks that whether you gather at Siegel high at 4pm today, or privately pray in your own war room – ask God for a miracle. That’s what Baylor needs. Pray also for rest for his family, as they have not slept at all. Please refrain from phone calls or visits for now. Updates will continue to come via this page. 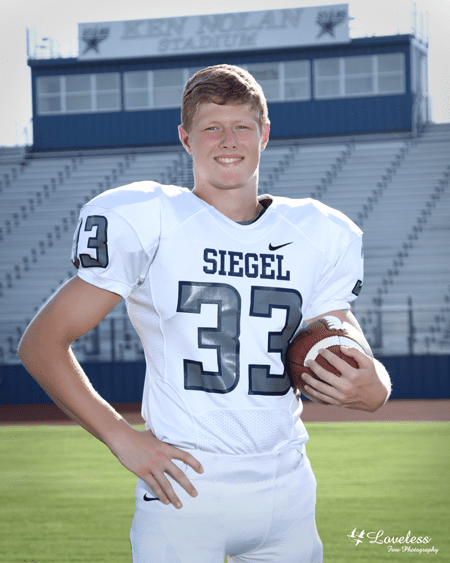 Please pray for Baylor Bramble (16, son of David & Christy) who was injured during a football game last night. He underwent emergency brain surgery at Vanderbilt Hospital and remains in critical condition. David & Christy request no hospital visits or calls at this time. We will post updates as they come available. Thank you for praying!